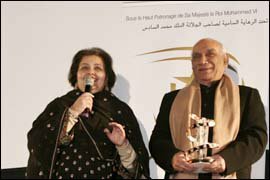 Marrakech---Yash Chopra, one of the hippest and trendiest directors of Indian cinema, was paid tribute on Monday at the Marrakech International Film Festival, currently held on Nov. 11-19 in Morocco's red city. “I am happy to be here in Morocco. I am very touched to know that I am already famous in Morocco, though it is my first visit. Moroccans know all my films and that's impressive.” Chopra told Morocco Times. On Sunday thousands of people gathered in Jamaa Lfna Square to watch Chopra's latest movie, Veer Zara. Veer-Zara is an immortal, beautifully narrated, love story. It's about Indian Veer Pratap Singh (Shah Rukh Khan), and Pakistani Zara Hayat Khan (Preity Zinta) who endured the suffering of their separation for 22 years. The film tells the story of Veer who has been in jail for 22 years. Saamiya Siddiqui [Rani Mukerji], a Pakistani lawyer, comes to know about the man who is languished in a Pakistan jail cell for 22 years and has not spoken to anybody. “Veer Zara's story is not about an impossible marriage between a Hindu and a Muslim, because there is no opposition in that. Rather, the movie is about the Indo-Pakistani friendship,” Chopra told Morocco Times.